Did you know that many are or have been almost 100% tithers? Among the many famous ones are William Colgate, (Colgate-Palmolive), James L. Kraft (Kraft foods), and Henry John Heinz (Ketchup). All three of these men started out tithing 10%, and so blessed were they by the practice, that at the time of their death, they were giving away almost 100% of their income! Twelve-year-old William Colgate woke with a start as someone pounded on the door of the house. It was the middle of the night in the small town of Shoreham, near London. William Pitt, the British prime minister, had sent a private messenger to warn his friend – Colgate’s father – that he must leave England or risk imprisonment or death. People knew that Robert Colgate had sympathized with the Americans during their recent fight for independence. So, in March 1795, the Colgates boarded ship for Baltimore. When the family arrived in America, they settled on a farm. Then William’s father formed a partnership with Ralph Maher to manufacture soap and candles, and William helped the two men. The partnership dissolved after two years – William’s father wanted to get back to farming. William, 19 years old, decided that he would go into business on his own. However, his business failed within a year. William determined to try again – this time in New York City. “Be sure you start right, and you’ll get along well,” advised a friend, a canal-boat captain who was a Christian. “Someone will be the leading soap maker in New York. It may be you! Jacob’s vow challenged William. He made a similar vow; he determined to give God first place in his life, and he also promised to give a tenth – a tithe – of his profits to God. In 1804, at the age of 21, William found employment with tallow chandlers Slidel and Company, where he learned more about the soap-making business. When, two years later, the company ceased production, William was ready to try again. 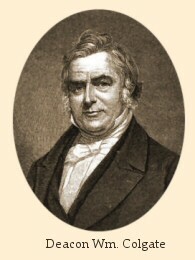 William Colgate and Company met with success from the start. Within six years he added the manufacture of starch to his laundry-soap business. Later, he also produced hand soap and a variety of toilet and shaving soaps. As Colgate’s business grew, so did his family. In 1811, he married Mary Gilbert, and they became the parents of 11 children – giving most biblical names. They attended church, had family worship, and read the Bible together. William became known as Deacon Colgate in his church. He liberally supported missions, temperance (the Colgates allowed no alcohol in their home), and Christian education. He donated large sums to several educational institutions, including Madison College, in Hamilton, New York. It’s now called Colgate University in his honor. William never forgot his promise to God. From the first dollar he earned he devoted 10 percent of his net earnings to benevolence. As he prospered, he instructed his accountants to increase the amount to 20 percent and later to 30 percent. It seemed that the more he gave, the more he prospered. He took an active interest in the Bible, particularly its translation, publication, and distribution. In 1816, he helped organize the American Bible Society, and later he assisted in forming the American and Foreign Bible Society. The soap king died on March 25, 1857, but his influence continues. The Colgate name lives on in products in supermarkets throughout the world. And the name still preaches a sermon to those who know his story. products form a part of the daily life. Others would certainly have seen these items at the general stores. but have you ever thought that the mint-flavored white paste that you squeeze out of the tube every morning has something to tell you? It bears a tremendous testimony to God's faithfulness of a man who was willing to take God at his Word - WILLIAM COLGATE. The Colgate family fled from England and settled in America during the Civil war. Robert Colgate, William's father, was a farmer. William was interested in soap-making and at the age of 19 he started his own enterprise with his aunt's financial help. He produced soap under his own name but unfortunately the business was a failure. Though William had to close down his initial business, he was determined to make a success of soap making . Encouragement came through the Bible and through a friend. In Genesis 28: 20-21 he read about Jacob who made a commitment to God as he left his home. Then Jacob made a vow to the LORD :If you will be with me and protect me in the journey I am making and give me food and clothing , and if I return safely to my father's home, then you will be my God... and I will give you a tenth of everything you give me." William prayed the same prayer. His Christian friend had advised him, "Start right and you will go well. Be a good man. Give your heart to Christ : give God all that belongs to him. make an honest soap and god will prosper you." William decided to honor God and give him first place in all his endeavors. He also decided that he will give one tenth of his earnings to God. William started his new venture on Dutch Street and gave God the tenth from the very first earning he made. God was given the first place in his life and career as he had covenanted. That was the beginning of a business enterprise, William Colgate and Company, whose products have conquered the world's cosmetic market. It's operations branched out from laundry soap manufacture into a host of other products, with in a short time. William was faithful to God and kept his promise. As God prospered him, he began to give more to God. From ten percent his giving gradually changed to 20 % then 30 and so on. The more he gave , the more he earned. The Bible was always a source of encouragement to William Colgate . He was greatly interested in the translation, publication and distribution of the Word of God. He was behind the formation of the American Bible Society in 1816. He supported the Bible cause generously and financed several educational institutions. To honor him , one university changed its name to 'Colgate University', after his death. William was a success as a Christian father. His family was known for its church attendance, family worship, Christian conduct and love for God's Word. Things like alcohol had never been to the Colgate home. All his 11 children followed his foot-steps and continued their father's practice of supporting God's work. William Colgate died in 1857, but his name is still not forgotten. The tooth-paste, soap, shaving cream and shampoo that we use daily do tell us this tremendous story of God's faithfulness, if only we listen.